I’ve been flipping through cookbooks a lot lately, tagging pages, writing down notes, drooling. I find whenever I’m in a bit of a rut with my cooking, just flipping through books helps me get back into the right frame of mind. There's one book in particular that has inspired me lately, and to be honest it’s not mine. It’s my mum’s. It’s this big Italian book that my dad and I bought her years ago as a present. I’ve been looking to buy my own copy so I can give hers back, but so far no luck. The book is called “The Food of Italy” and although there are new versions out there, I want the original. Yeah, I’m difficult like that. I don’t exactly follow the recipes, they mainly just give me ideas. The other day while flipping through it I came across a seafood risotto recipe. Ahh.. yes. I made a really good seafood risotto not long ago. Sitting on the couch I thought, I need to make this again. Yesterday while out at breakfast Colin came up with the idea to make it for dinner (he gets a lot of credit on this post, mainly because while I was setting up to take the photos, I left him to cook this dish). We went to a near-by seafood shop and bought some marina mix that was already marinating in chilli and parsley (tick; don’t need to buy those two things). Now I love risotto, and when I make it I add loads of parmesan because well, I love that too. 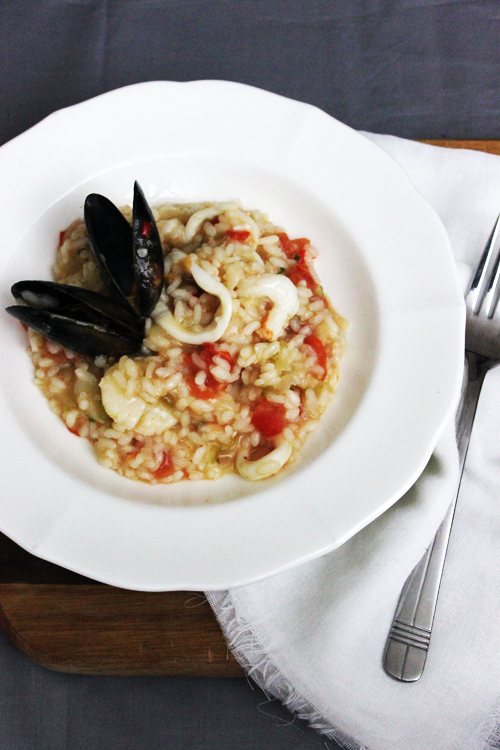 Seafood risotto is a different story. There’s a debate on whether you add cheese to any type of seafood pasta or risotto. My book told me not to. My mum says not too. My Zio in Italy, he does. Although most will say no. I decided not to, and even without it the risotto was still so creamy and delicious. Heat the stock in a pot and keep hot throughout cooking. In a separate pot, heat a good slug of olive oil, and quickly fry off the seafood in batches for a minute or so, taking them out as soon as they turn opaque (you want to make sure that you only just cook the seafood as it will continue to cook when it is added to the risotto). Set them aside. In the same pot, add a bit more olive oil and 1 knob of butter, then add the onions, celery, garlic and chilli, and fry on a medium heat for about 15 minutes until the vegetables have softened. Turn the heat up and add the rice, stirring until all the rice is coated with the oil. Add the wine and keep stirring to cook out the alcohol. 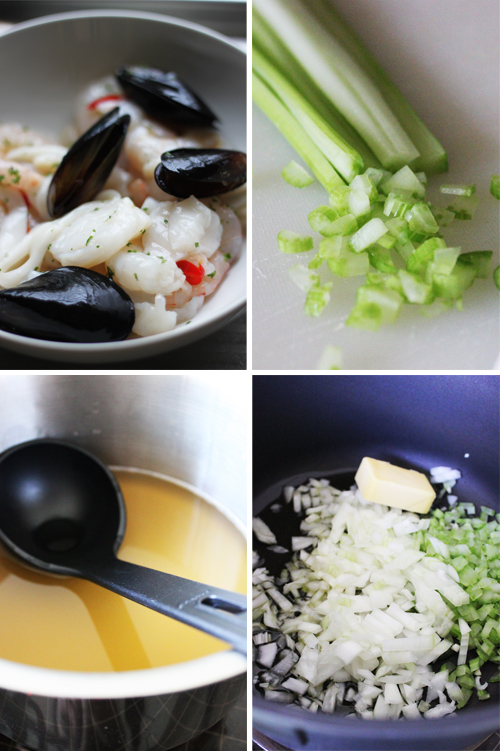 Remove from the heat and add 1 knob of butter, the chopped tomatoes, parsley and seafood, and stir through. Place the lid on the pot and let it sit for a couple of minutes to help the the tomatoes cook and the liquids come together. You might want to add a little more liquid if the rice absorbs it all. This would be such a hit in my house. I LOVE risotto (creamy + dreamy!) and my husband loves seafood. What a winning combination. I just got back from a week in London, where I ate out for every meal. It threw me out of the habit of cooking, something I normally love, and it took a few days to get back into the swing of things in my kitchen. And like you, I turned to cook books! Especially Nigella Lawson...her dishes always inspire me! I have Nigella's book Feast (also "borrowed" from my mum), and her chocolate cakes amaze me! I like Jamie Oliver's book too, mainly cos his photos are always so rustic and comforting! And I love your words for risotto - creamy and dreamy. Perfect! 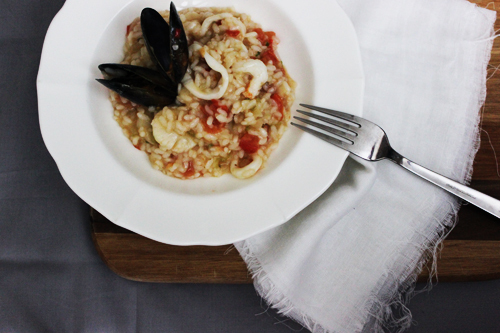 My husband and I have been on the lookout for a good seafood risotto recipe since our honeymoon in Positano--this looks delicious! I think I'll give it a go for dinner this Saturday!